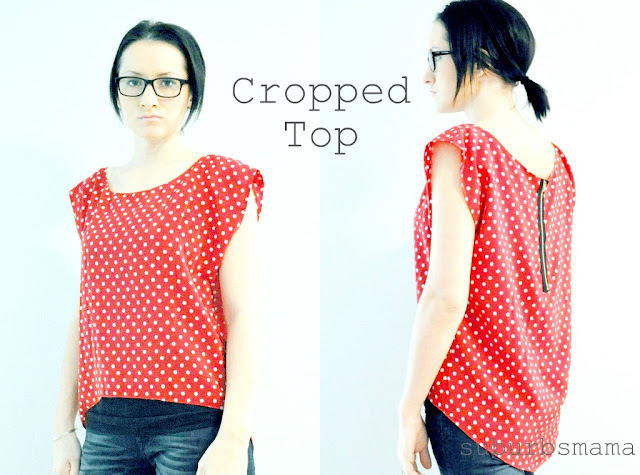 I have seen so many cropped tops lately. I thought it would be so easy and fun to make one, since it is basically a square or rectangle. I had some of this polka dot fabric which I picked up at the fabric store last year. I just never got around to making anything. I gotta say, I am really liking it. I want to make at least one more for myself, perhaps in a solid color. Next time I will have to cut the fabric a little wider so I can make the sleeves a little longer. First determine how long and wide you want your top. Here is how I finished the zipper hole. I think it would have looked really pretty with a button to. Then I sewed on the zipper with matching thread. Exposed zippers are so easy! Then I eyeballed how I wanted the "sleeve" to look and marked it with a pencil. Then I used an old shirt of mine with a rounded bottom as a template for the hem. For the front I just flipped the shirt upside down to get the "cropped look"
I cut the "cropped" front and longer back. I managed to sew the top and take the pictures all during my little mans nap time. That should tell you how fast and easy it was! Wow, you did a great job!! This is super cute!! I love the fabric you chose, and it looks great on you! Thanks for sharing at oopsey daisy! this is fantastic! I love how easy it seems! I'm hosting a Favorite Things linky party and would love it if you stop by and post something! Hi, I´m mother of two from Czech rep. and I really love your blog! thnak for a big hug of inspiration, tutorials! So cute...I should make a few of these to wear over the ever-beautiful nursing tank tops, haha! I definitely need to follow you, you have great ideas! Great job and super cute... I love how the back is longer than the front! love this! I have the perfect fabric to make something like this! Pinning now so I can come back later! Awesome! found you through handmade 52. I have some great fabric to try this with. Thanks for the tutorial! I love your top! The combination of the red/white and the exposed zipper is great, and I can't believe how easy it was to make - might have to go searching through the cupboard for some appropriate material to make one for myself! Really cute. Might have to add this one to my list! I love it, thanks for the tutorial! Wow! It looks great...and you make it look so simple! Thanks so much for linking up at Shine on Fridays. This top came out great! such a cute top! I could probably never get the neckline to lay so smooth!